Yesterday, Reverend Mother Catherine of Alexandria, 73, nun of the Abbey of Regina Laudis, made her transitus to the Lord. Mother Catherine’s death follows a long illness. The Mass of Christian Burial is scheduled for 2 February 2013, 10am. May Mother Catherine’s memory be eternal. 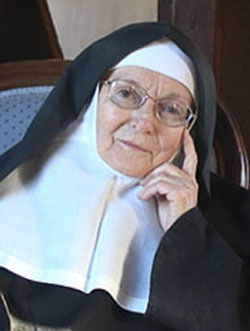 Reverend Mother Catherine of Alexandria (née Kathleen Janet) Talbot, 73, member of the Abbey of Regina Laudis, died at the Abbey on Thursday, January 31, 2013, Feast of Saint John Bosco, after a long illness. She had been manager of the Monastic Art Shop for over twenty years and was devoted to the many volunteers who staff the Art Shop. A chemist by profession, Mother Catherine brought that training to her work in the Abbey herb gardens and as Administrator of the Abbey herb department, known as La Reine de Saba (Queen of Sheba). She created many herbal preparations and perfumes, including the “St. Cecilia” chrism fragrance. She brought her gift for administration to the Financial Office of the Abbey, a work to which she was committed for many years even during the final period of her illness. Kathleen Talbot was born on March 14, 1939, in Laramie, Wyoming, the oldest of four children to Edward James and Janet Bare Talbot. Her father Edward taught Agricultural Economics at the University of Wyoming, served in the U.S. Navy in WWII, and worked for many years for the Bureau of Reclamation, specializing in contract sales of water and hydroelectric power. Her mother Janet taught violin and worked in the Department of the Interior in Washington DC, helping to create their first inter-library loan system, and later worked with the Bureau of Reclamation in Denver. Growing up in the West, Kathleen’s great love was camping, which she did often with her family and extended family. This love of camping was also nurtured through her participation in the Girl Scouts throughout her youth. Kathleen earned a Bachelor of Arts degree in Chemistry from the Catholic University of America and a Master of Science degree from the University of Sheffield, England. Her first employment as a chemist was as a technician at Hazleton Laboratories in Falls Church, VA, where she was responsible for quality control of basic elemental analysis of anti-cancer drugs being developed by the National Institutes of Health (NIH). Her graduate research was on the effect of glycerin on aqueous soap solutions and this work culminated in a Master of Science degree in Colloid Chemistry. She was a Research Assistant to Dr. A.S.C. Lawrence at the University of Sheffield. When she returned to the United States, she worked as an Analytical Chemist at the USDA Agriculture Research Service in Beltsville, MD doing basic research on problems of plant nutrition, particularly in ion uptake by plants. Kathleen married Louis N. Stief on November 30th, 1963. They had two children, Andrew and Lorraine. In 1970, Kathleen moved with her family to Southwest Washington, DC where her children attended DC public schools. In addition to raising two children, Kathleen became very active in local organizations that supported and built the community of Southwest Washington, DC. From 1976-1978 she was President of the Southwest Neighborhood Assembly, a volunteer civic association serving 15,000 residents in areas of planning, development, zoning and environmental issues. During her tenure as its President, the Assembly received the 1978 Metropolitan Washington Volunteer Activist Award “for its voice in municipal affairs and improvement of life in Southwest Washington”. She was the Editor of The Southwester, the Assembly’s monthly community newsletter, which was awarded the Washington Post Trophy in 1977 for its outstanding quality. Kathleen served for 3 months in 1978 on the Transition Task Force of DC Mayor Marion Barry, researching structure, programs and problems of the 36 Advisory Neighborhood Commissions in the city and the Community Services Division of the DC Government. One of the projects she supported which came to fruition during her time in Southwest Washington was the building of two low-income housing apartments known as “Greenleaf”. From 1980-1983, Kathleen worked as Administrative Secretary for the National Catholic Educational Association, Washington, DC, in the Religious Education Department. Even while active in so many community associations, Kathleen had a long and deep attraction to contemplative life. Her daily reading of the Rule of St. Benedict was a touchstone for her during difficult years that culminated in the annulment of her marriage in 1976. Through her association with Fr. Joseph Fox, O.P. she was introduced to Regina Laudis. With the support of her children, now stabilized as young adults, Kathleen Stief entered the Abbey of Regina Laudis as a Postulant on September 30th, 1983. Very soon after entering the Abbey and throughout her monastic life, Kathleen worked with herbs, growing and harvesting them and creating herbal preparations, including the well-known “St. Cecilia” chrism. In 1984, she became administrator of the Abbey Herb Department, La Reine de Saba. Kathleen entered the Novitiate on January 25, 1985, Feast of the Conversion of St. Paul, receiving the name of Sister Catherine of Alexandria. She made her first vows September 8, 1990, Feast of Our Lady’s Nativity, and her perpetual vows on July 29, 1996, Feast of Saints Martha, Mary and Lazarus, Hosts of the Lord. Mother Catherine was Consecrated on July 11, 2007, Feast of St. Benedict, at the hands of Archbishop Henry J. Mansell. With her love of the Divine Office, Mother Catherine was very active as a Mistress of Ceremonies in the Liturgy Deanery of the Abbey. Her gracious demeanor was appreciated by those she served for many years at St. Joseph’s guest house as well as by numerous guests who worked with her in the herb gardens. Mother Catherine of Alexandria’s great grandfather, David Reid, worked for the Union Pacific Railroad. He was known as the Water Man who was responsible for replenishing the water in the train’s engine. Midway between Laramie and Cheyenne in the parched landscape of Buford, Wyoming there was a tree growing out of a large boulder near the line of the Union Pacific Railroad. Whenever the train passed that way, the Water Man would drench the tree with a bucket of water. Tradition holds that the line of the railroad was slightly adjusted to avoid destruction of this indomitable tree. For Mother Catherine, this phenomenon, of a tree growing from solid rock, was a deep symbol of her journey and monastic life. It inspired the image on her Clothing card and the accompanying quotation. I planted, Apollo watered, but God gave the increase, Alleluia. Besides her monastic community, Mother Catherine is survived by her brother Kevin and sister-in-law Rusty, her son Andrew Stief and daughter-in-law Michelle Taylor Stief, of Germantown, MD, her daughter Lorraine Stief Brush, and son-in-law John Brush, of McCall, ID. She was pre-deceased by her younger sisters, Mary Elizabeth who died as an infant, and her sister Elizabeth Ann in 2004. Calling hours will be at the Church of Jesu Fili Mariae at 15 Robert Leather Road in Bethlehem on Friday, February 1st from 11:00 A.M.–8:30 P.M. and Saturday, February 2nd beginning at 8:00 A.M. followed by the Requiem Mass at 10:00 A.M. and burial in the Abbey cemetery. In lieu of flowers, donations to the New Horizons Renovation Project would be gratefully accepted on-line or c/o The Abbey of Regina Laudis, 273 Flanders Road, Bethlehem, CT 06751. You also follow the nuns on Facebook. Just about a week ago did Mother Placid Dempsey, nun of the Abbey of Regina Laudis, make her way to the Lord. Her final act of earthly love to the One whom she committed herself to in this life, and lived in communio with for 85 years, accepted the invitation of the Lord for life eternal. 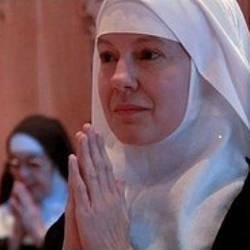 Mother Placid was the first Benedictine nun of Regina Laudis that I met; we were introduced by a mutual friend, Palma. And boy was she helpful in a time of my life that needed reassurance. It’s amazing to read all the things one does in life when one dies; her obit shines but a little light on a person many only aspire to be. Mother Placid was a unique woman of faith. I am grateful for the times we’ve met in her lucid years. Her diminishment was hard to watch. The last time I saw her in person a few years ago following Mass it was as though we met for the first time. The illness bore her mind away but her smile was all I needed. I think it was she behind the grill at the abbey church that walked with help in and out choir. I offered my prayer for Mother. Someone characterized Mother Placid perfectly: “Wise, impish, witty, given to sharp spiritual insights and equally pointed….” All of which was true to my experience and for which I am grateful. Grant, we pray, almighty God, that the soul of your servant Mother Placid, who for love of Christ walked the way of perfect charity, may rejoice in the coming of your glory and together with her sisters may delight in the everlasting happiness of your Kingdom. The obit posted by the Abbey follows. Reverend Mother Placid (Patricia Ann) Dempsey, 85, consecrated nun of the Abbey of Regina Laudis, died September 27, 2012 at the Abbey after a long illness. Described as a tiny giant, Mother Placid–artist, poet, and guest mistress for over 50 years–touched the lives of thousands of people. Costello Dempsey, teacher and housewife. The Dempseys migrated to America at the time of the great famine in Ireland and settled in Pennsylvania where Mother Placid’s grandmother ran a saloon in the mountain mining town of White Haven. The Costellos were metal craftsmen for centuries in Ireland. Her maternal grandfather was instrumental in bringing the Knights of Columbus to Brooklyn. home as “…warm and intellectually stimulating with discussions of cultural matters, philosophical questions, and legal matters”. After graduating from St. Angela Hall Academy High School, she received her Bachelor’s Degree in Art from Marymount College (Tarrytown NY) in 1949. In both high school and college she was awarded honors for her art. She was active in all aspects of drama, especially scenery design and construction. She also participated in many cultural and charitable activities, including social activities for the blind, infirm and pre-school children. Patricia Dempsey entered the monastery as a Postulant on August 18th, 1949, one of the first American postulants and the only one of that group to persevere in the monastery. As a novice she received the name Sister Placid, after the faithful disciple of St. Benedict. She was perpetually professed and consecrated on the Feast of the Ascension, June 3rd, 1954. Besides her work as artist, teacher and guest mistress, Mother Placid was a Council member and Postulant Mistress for a number of years, as well as Mistress of Ceremonies. She helped write and present in Rome the Abbey’s first Constitutions. Her extensive work as monastic artist included painting, graphics, vestment design, enamel, wood, stone and concrete sculpture, and book illustrations, notably the covers of several of the “Classics of Western Spirituality” series. Her work has been exhibited in galleries in this country and Europe, especially in New York City and Paris. Her well-known “Stations of the Cross”, hand-carved out of a neighbor’s cherry tree, grace the walls of the lower monastery chapel at the Abbey and continue to be a source of prayer and inspiration for visitors. Mother Placid designed scenery for several Abbey plays as well as buildings used for the Abbey fair. She was instrumental in the development of monastic crafts and supervised the renovation of the Monastic Art Shop to include an art gallery and display space. 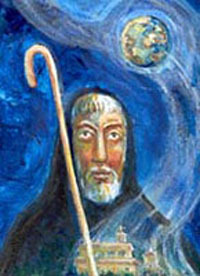 In the Abbey, Mother Placid taught classes in monastic history and spirituality, philosophy and the Rule of St. Benedict. She was much influenced in her early life by the writings of Jacques and Raissa Maritain whom she later met when they visited Regina Laudis in 1949. She maintained scholarly and spiritual friendships with psychiatrist and author Dr. Karl A. Menninger, and with Caryll Houselander, the English Catholic author. Among her most cherished relationships was the one with renowned children’s book illustrator Tomie dePaola, who first came to Regina Laudis as an art student. They became colleagues and fast friends, each enriching the other’s work and life. Always faithful to the vision of Lady Abbess Benedict, foundress of the Abbey, Mother Placid’s unique and transformative contribution to Regina Laudis was her ability to translate monastic values into contemporary language. 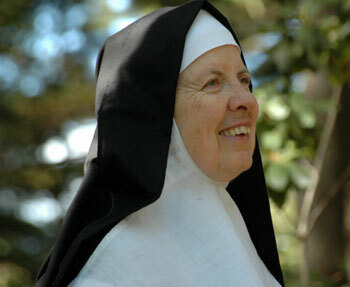 She was instrumental in receiving the many young people who were drawn to the monastery in the 60’s and 70’s, and helping them to see their own lives and process of seeking as valuable and “of God.” Her deep sense of culture and breadth of education, and her frank love of people were supreme assets in this work. Moreover, she brought a depth of wisdom and understanding, in her inimitably playful way, to the work of forming communities of laypersons desiring to give themselves to Christ, through their professions. Besides her monastic Community, Mother Placid is survived by her numerous nieces and nephews, including Mother Praxedes Baxter, OSB, also of Regina Laudis, and by great-nieces and nephews. Prayer of the Faithful offered by Mother Prioress Dolores Hart at the Requiem Mass for Mother Placid, September 29, 2012, Feast of St. Michael the Archangel. from the sheer wild love that only restraint can know in the silver light, the cool delineated air of mellow violence. FREEDOM IS LOVE IN FULL CAPTIVITY. I was reminded earlier today of a need to pray for vocations to the contemplative life. A former colleague of mine recently entered Dominican life as a cloistered nun at Saint Dominic’s Monastery in Linden, VA. It is a traditional monastery of nuns, a very young of women who make a sacrifice to pray for us and the needs of the world. The postulant, Sister Lauren (left) is seen with a veteran nun, Sister Mary Dominic. As an aside, the Huffington Post had this special article with pictures of those who “thought” they had a vocation. One actually did pursue a vocation as a Benedictine nun at Regina Laudis Abbey (Bethlehem, CT), Mother Dolores Hart. 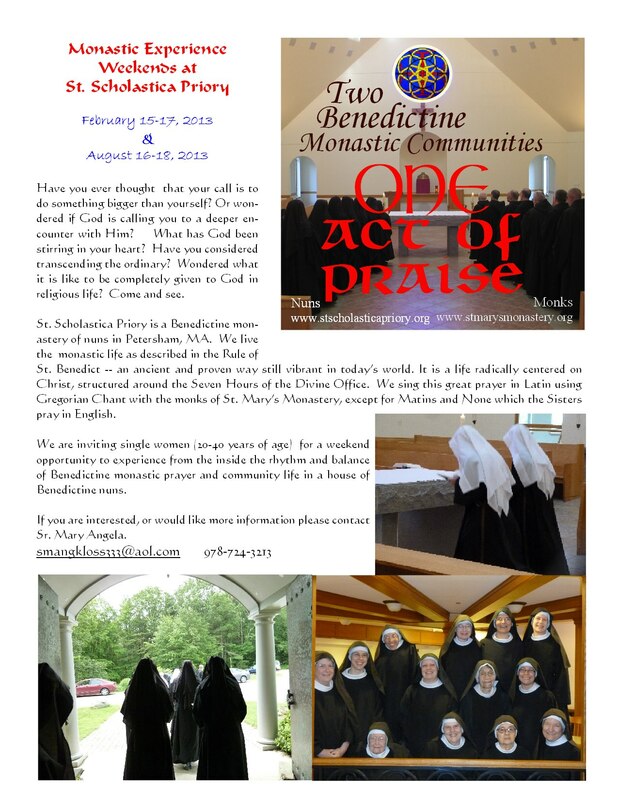 One of the US’s monasteries of Benedictine nuns is getting a lot media attention lately. Regina Laudis Abbey (Bethlehem, CT) is now recognized by the European Catholic press for a story written by Mauro Pianta for the Vatican Insider, “U.S. : Cameron’s former lover becomes cloistered nun.” Mr. Pianta tells of the UK’s Prime Minister David Cameron’s former very beautiful girlfriend who found her vocation in the American abbey after a conversion in her life. Sister John Mary known in history as Laura Adshead left the world to follow Christ. Let’s note, however, Sister John Mary has been at the Abbey for four years, now. So this story is not exactly new, but it is good to know that smart women still follow the Lord’s call. The original story online at The Daily Mail reveals the story better.